Ham, cheddar and tomatoes are combined in this hot ham and cheese sandwich. Cut top half of loaf from bottom of loaf. Scoop out the inside portion of the bread. Evenly spread 1/2 the mustard on each half of bread. In a small bowl mix ham, cheese and tomatoes. 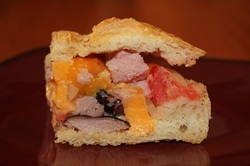 Arrange ham, cheese and tomatoes inside the scooped out portion of the loaf. Replace top half of loaf on ham and tomatoes. Place sandwich on baking sheet. Bake for 10-15 minutes, or until warm and cheese is melted. Cut into wedges and eat warm.